I was flattening a decent headwind, and looked over my shoulder to check Caroline was still on my wheel. Evidently I wobbled a tiny bit as I heard a yelp of surprise. Followed by: “Norm wouldn’t do that. Norm is steady“. So, Normand Howison, this is to let you know, you are the Gold Standard of cycling partners. Am I hurt? No… no really, not a bit… sniff. To be fair, this followed a difficult and slightly fractious session. 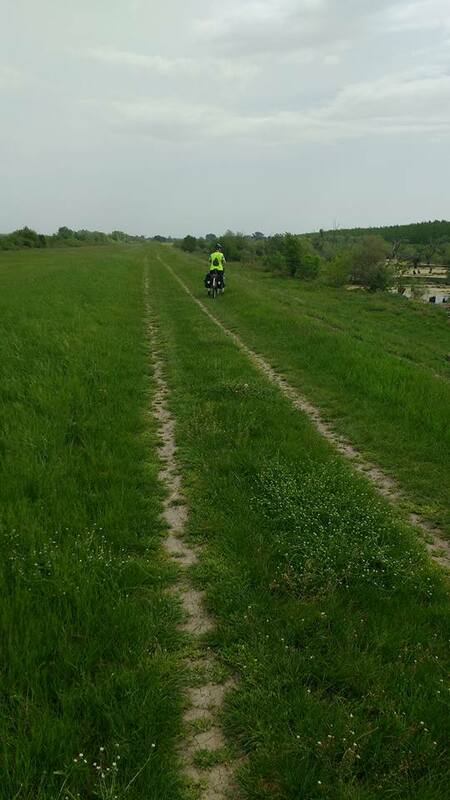 Running the gauntlet of Belgrade traffic, dicing with death on the Pancevo Bridge, and plodding as the official path crossed grassy fields, where diggers twice dumped loads of earth right across the path in front of us. Things looked up. The road got quieter and faster, and eventually we were flying along the final KMs towards the ferry port at Stara Palanka. Not before a final grassy section though, alongside a tributary with Cuckoo, Egrets and Herons all displaying. Lovely spot after the coaches left. Leaving on the first ferry in the morning.